Should I eat airline food? The second largest country in the world, Canada is home to some spectacular sights and attractions to explore. 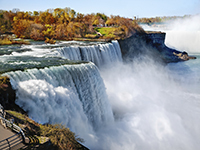 Niagara Falls is a breathtaking waterfall display on the border with the United States, while Banff National Park and Toronto’s CN Tower are two of the country’s famous landmarks. Roughly 724,000 British nationals travel to Canada each year, which is only accessible from the United Kingdom by airplane. Given its total area size of 9,984,670 km², the length of your trip will be dependent on which part of Canada you are visiting. Travelling from Birmingham to Toronto can take an average time of 13 hours, while travelling to Vancouver, in the south west of Canada, will more likely require around 18 hours of travel from Birmingham. If you are unsure as to how to manage your medication while in the air then you should discuss a plan with your diabetic specialist. There are two diabetic associations in Canada, with the addresses and contact information listed inside this travel guide. The time difference in Canada is again dependent on where you are visiting. Montreal, for example, is four hours behind Greenwich Mean Time (GMT), while Vancouver is seven hours behind GMT. Assessing what time you will be adjusting to before you depart is crucial to evaluate how to implement your medication plan. This should be discussed beforehand with your diabetes team. Canadian weather can result in very cold winters, with Toronto barely seeing temperatures over 1°C during winter, although summer temperatures are more comparable to the UK. Even Victoria, one of Canada’s warmest cities in British Columbia, is not too dissimilar from UK temperatures, so your diabetes management should not end up being affected by the weather in Canada. The currency used in Canada is the Canadian Dollar, although ATMs are easily accessible throughout most cities, while most credit and debit cards will be accepted at shops, restaurants and hotels. There are no mandatory vaccinations required to enter Canada, but this opportunity should be taken to ensure existing vaccinations such as your yearly flu jab and those against polio and tetanus are also up to date. UK citizens with diabetes will not be entitled to any free medication services while in Canada. Securing comprehensive medical insurance will be essential in order to obtain even basic treatment. Diabetic medication is available in Canada, but payment will be required from all pharmacies. Blood and urine testing kits are available from pharmacies in Canada. The emergency services telephone number to be called in Canada is 911. This number may not be applicable in certain rural areas. For communities not equipped with 911 services, dial “0” and ask the operator for assistance. You should note which syringes are available in Canada, with U-100 syringes the most commonly used. The vast majority of insulin in the UK is U-100 insulin. If you need to take a different strength of insulin, say in an emergency, it’s important that you use the correct device and syringes for that insulin. For example, you would use a U-40 syringe for U-40 insulin. You will need to work with a doctor getting the right dose if you’re using a different form of insulin. It is important to note the diabetes associations in the country you are travelling to in case of an emergency. How is blood glucose measured in Canada? Blood glucose levels are measured in mmol/l, as they are in the UK. What language is spoken in Canada? English, although French is spoken in many provinces such as Quebec.